This week’s Modern Baker Challenge cake features one of my favorite flavors. No, I don’t mean dark rum (although I’m certainly not opposed to rum). I’m talking about bananas. Regular readers of my blog know about my obsession with all things pumpkin, as well as my love of apples. But I am equally enamored with bananas. Now, that doesn’t mean I’ll eat anything that’s banana flavored. In fact, like strawberries, while I love real bananas, I really dislike “banana flavored” foods. But give me a fresh banana, or better yet a baked good made with ripe bananas, and I’m a happy man. So this cake was right up my alley. It combines ripe bananas with rum and coconut for a delicious tropical flavor baked into a homey layer cake. To make the cake layers, I beat butter, granulated and dark brown sugars, and vanilla until fluffy, then added eggs. I mixed flour, baking powder, baking soda, and salt in one bowl and mashed bananas, milk, and dark rum in another. I alternated adding these to the butter mixture, beginning and ending with the dry ingredients. I beat the batter for several minutes to lighten it, then divided it between two 9-inch pans. I baked the cake layers in a 350°F oven for about 25 minutes, until the cake was well risen, golden, and firm in the center. This cake smelled good enough to eat right out of the oven. But I resisted and cooled the layers while I made the frosting. As I’ve baked my way through the Cakes section of The Modern Baker, I have really come to appreciate the simplicity, lightness, and wonderful flavor of whipped cream as cake frosting. And when you add rum to the whipped cream, well, things can only get better. Having cooled the layers and made the frosting, which consisted of whipping cream, sugar, and dark rum, I was ready to assemble the cake. I placed the first layer on a cake plate, sprinkled it with about a tablespoon of dark rum, and spread the top with whipped cream. 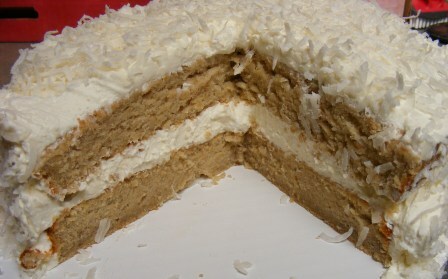 I inverted the second layer on top of the first and topped it with rum and whipped cream. 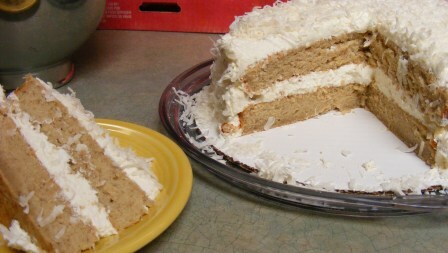 I spread the frosting over the top and sides of the cake, then pressed coconut into the frosting. We enjoyed this cake for dessert, and everyone asked for seconds. 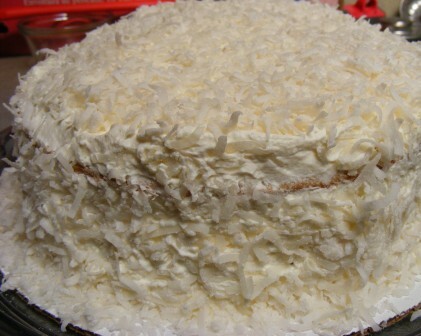 This cake was delicious, with the tropical flavors of banana and coconut shining through. And even though it had dark rum in the batter and frosting, it wasn’t at all boozy tasting. This is another celebration cake: one that’s simple enough to make for any gathering, but impressive enough to commemorate those special occasions. The next cake in the line up for the Modern Baker Challenge is one I’ve only made one other time, with disastrous results. 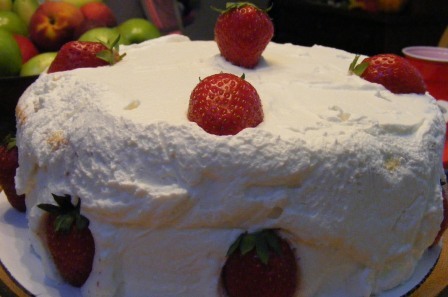 Last June I made — or tried to make — a French Strawberry Cake for Tuesdays with Dorie. There was a lot of chatter on the TWD site at the time about Dorie’s recipe not being a true génoise because the eggs weren’t heated prior to being whipped. Having never made a génoise at the time, all the talk just struck me as people’s opinions about what a “real” génoise should be. I just followed Dorie’s recipe and trusted that everything would work out right. It didn’t. 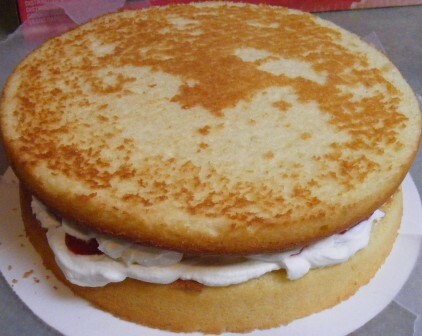 You can check out the French Strawberry Cake post to see just how wrong things went. Suffice it to say, after that experience, I wasn’t looking forward to making another génoise anytime soon. I needn’t have worried. Like nearly all of Nick’s recipes, this one is clear, precise, easy to follow, and foolproof. I began by combining eggs, egg yolks (Nick uses extra yolks to add tenderness, moisture, and stability to the batter), vanilla, salt, and sugar in a mixing bowl. I set the bowl over a pan of simmering water and heated it until the mixture was lukewarm. I beat the egg and sugar mixture with the whisk attachment on my mixer for about five minutes, until it was light, fluffy, and had more than tripled in volume. The recipe calls for a fairly small amount of flour, which is mixed with cornstarch, sifted over the egg foam, and then mixed in gently in three additions. Unlike my previous experience, folding in the flour didn’t cause the foam to collapse, and I was able to get all the flour mixed in. I scraped the mixture into a buttered 9-inch springform pan. You’ll notice that there is batter around the edge of the pan. The instructions say to tip the pan and rotate it so that the batter runs to the top all the way around the inside of the pan. This is supposed to make the cake bake flat on the top, rather than doming in the center. Since my previous génoise baked up lopsided (before collapsing), I was hopeful that this trick would work. If you own a copy of The Modern Baker, turn to page 241 and note the similarity between this cake and the one pictured there. Mine came out almost exactly like the one in the book! The layer was light but firm. And to my surprise and delight, it rose high enough to be cut into three layers. Check out this post to see what I used the layers for, but suffice it to say, this cake was wonderful — light, delicate, and very flavorful. Thanks to Nick I now not only know what a classic génoise is supposed to look and taste like, I also know how to make a perfect one! It’s Ice Cream Week here at Of Cabbages and King Cakes! Five days devoted to everyone’s favorite summer treat. Today’s theme is “Fruits of the Summer”, which I have loosely interpreted to include one of my favorite farmer’s market finds: red beets. This is a really easy recipe to put together. Roasting the beets is the most time-consuming part, and it’s mostly hands off. After trimming and cleaning the beets, you wrap them in foil and roast them until tender. 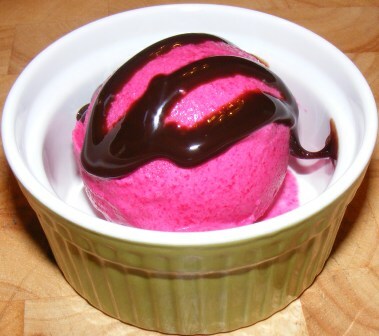 The most striking thing about this recipe is the color: it’s this amazing, not-at-all-natural-looking fuchsia. It was surprisingly good, especially with a little chocolate syrup. The beet flavor really came through and, combined with the citrus, made this ice cream both bright and earthy. Preheat oven to 375°F. Trim stems and roots from beets. 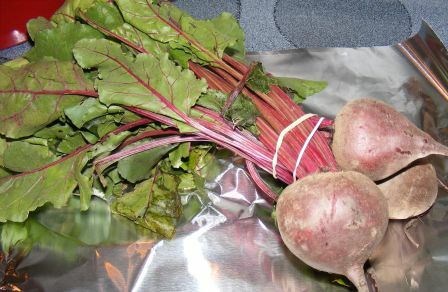 Wash beets and pat dry with paper towel. 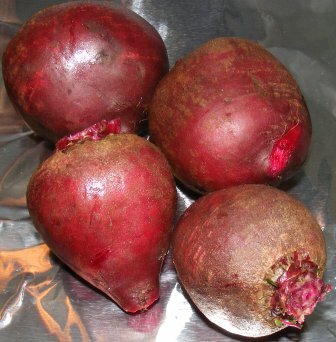 Wrap beets in heavy duty aluminum foil and roast directly on center rack in oven for 1 hour and 20 minutes. Carefully remove foil package from oven. Squeeze beets. They should give a bit but still be somewhat firm. If necessary, return beets to oven and roast until done. Unwrap beets and allow to cool until cool enough to handle. 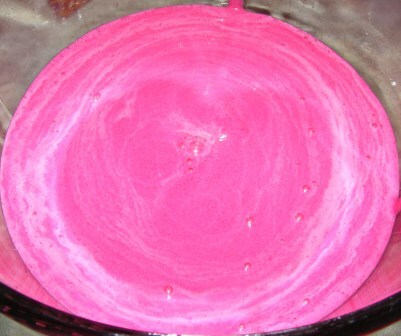 Rub beets to remove skins, then dice beets and place in food processor. Zest the orange and add to food processor. Juice orange and add this, along with 1/4 cup additional orange juice, to food processor. Process mixture until smooth. Add sour cream, sugar, and half-and-half and process until smooth and completely combined. Press base through a fine mesh sieve into medium bowl. Cover bowl and refrigerate until well chilled, preferably overnight. Process base in ice cream maker according to manufacturer’s instructions. Serve with drizzle of chocolate syrup. I know it sounds like an odd combination, but it’s worth making, if only for the color. It’s day five of Strawberry Week here at Of Cabbages & King Cakes. And today’s theme is a simple one — strawberries make everything better. 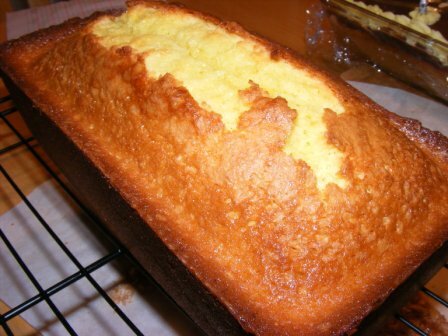 This is Lemon Ginger Pound Cake from the Cakes section of the Modern Baker Challenge. In the recipe notes, Nick Malgieri states that this cake needs no accompaniment. And he’s right. It’s a great cake on its own. But with height-of-the-season strawberries and freshly whipped cream, it’s sublime. This is the second recipe in the Cakes section of The Modern Baker. 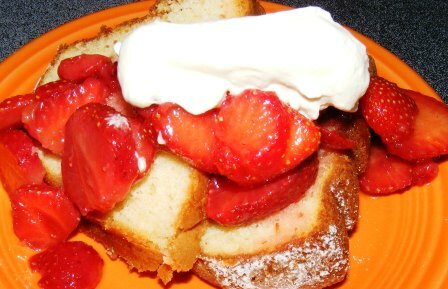 After starting this section with the delicious but fussy Perfect Pound Cake, I was looking forward to trying this simple, quick recipe. Other than grating lemon zest and ginger (I used pregrated ginger), this cake takes almost no time to throw together. 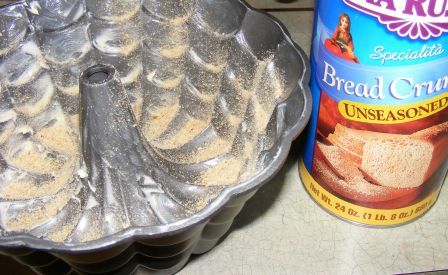 This cake is baked in a bundt pan, which is buttered, dusted with fine bread crumbs, and then sprayed with cooking spray. The bread crumbs seem like a strange addition, but they bake into the cake without a trace. 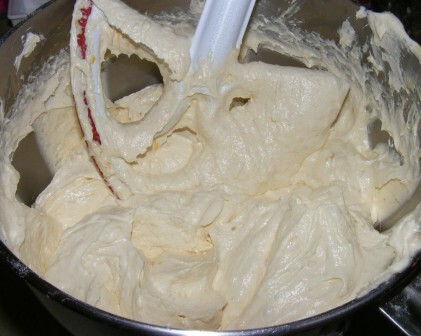 To mix the batter, I began by combining flour, sugar, baking powder, and salt in the bowl of my stand mixer. I added butter and beat it with the paddle attachment until it formed a heavy paste. Then I added the remaining ingredients: eggs, egg yolks, milk, lemon zest and juice, and ginger, and beat the batter until it was light and fluffy. 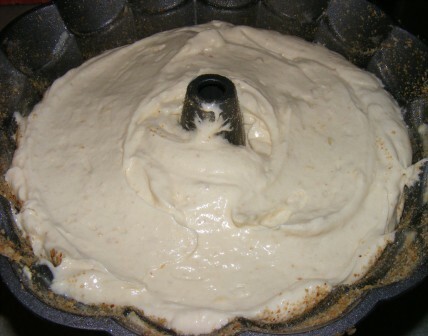 I scraped the batter into the prepared pan and smoothed the top. 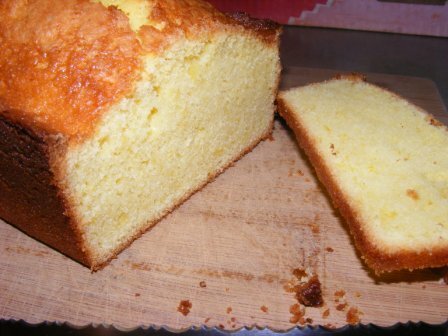 I baked the pound cake at 325°F for about 50 minutes, until it was firm, golden, and baked throughout. After cooling the cake in the pan for five minutes, I turned it out onto a rack to finish cooling. I dusted the top of the cake with powdered sugar and served it for dessert. 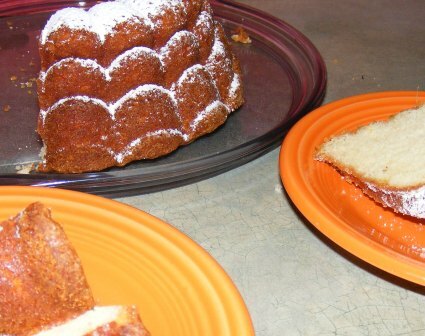 The lemon and ginger combined to give this pound cake a wonderful flavor. We ate it plain the first night and really enjoyed it. But when we topped it with strawberries and whipped cream the next evening, we realized we had really hit on something. 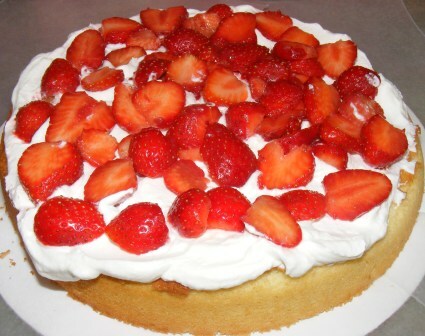 Check out the other Strawberry Week entries, starting with Monday’s Real Strawberry Shortcakes. Man, I can’t wait until strawberry season next year. It’s Strawberry Week here at Of Cabbages & King Cakes. Six days of posts featuring this delicious fruit in all of its height-of-the-season goodness. Monday began with an amazing Strawberry Shortcake, followed on Tuesday by a not-so-amazing French Strawberry Cake (hey, they can’t all be winners). 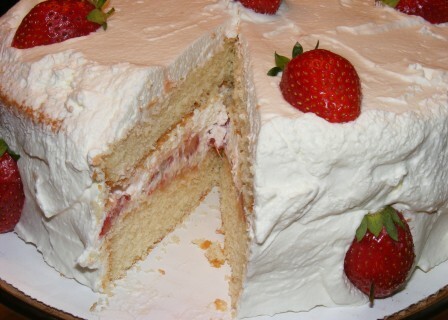 After my French Strawberry Cake disaster, I was ready to make a tried and true strawberry cake. 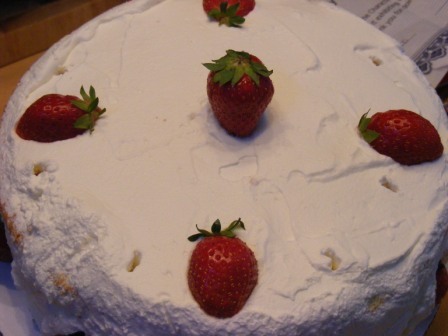 Mom and Dad were coming, and it was Mom’s birthday, so I decided to revisit the Strawberry Chantilly Cake recipe from Nick Malgieri’s Bake! that we made last year for Easter and my friend Kayte’s birthday. Since we recently started the Cakes section of the Modern Baker Challenge, I decided to use the Yellow Cake Layers from The Modern Baker for this recipe. 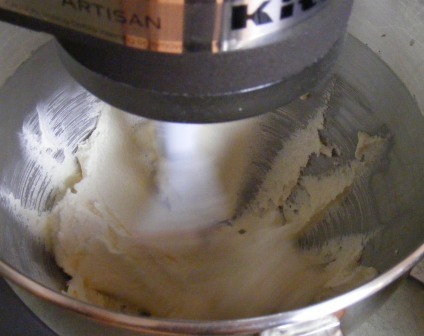 I began by creaming butter, sugar, and vanilla in the electric mixer until the mixture was light and fluffy. I added the eggs one at a time and mixed well after each addition. Next I mixed in half the dry ingredients (flour, baking powder, and salt), then the buttermilk, and finally the rest of the flour mixture. I beat the batter for 3 minutes to lighten it. 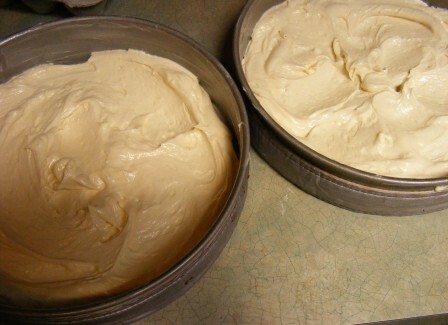 I divided the batter between two 9-inch cake pans and smoothed the top. I baked the cake layers in a 350°F oven for about 30 minutes, until they were golden and baked through. I let the cakes cool completely before assembling the Chantilly cake. As noted in my original strawberry Chantilly cake post, the recipe is really more a set of assembly instructions than a recipe. I began by putting one of the cake layers right side up on a cake cardboard. I tucked pieces of waxed paper under the edges of the cake to keep the cardboard clean. 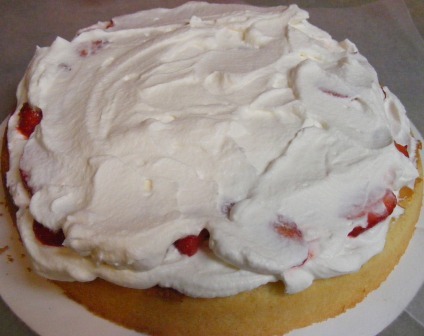 I spread a layer of freshly whipped cream on the top of the cake, followed by sliced strawberries. I topped this — carefully — with another layer of whipped cream. I turned the second cake layer upside down and put it on top of the first layer. 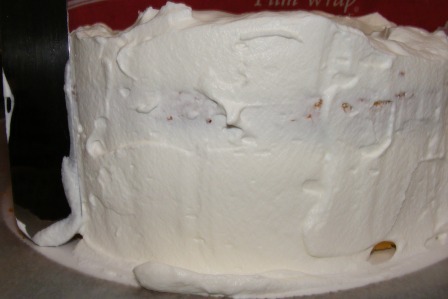 I spread whipped cream on the top and sides of the cake, then smoothed it with an offset spatula. I learned from making this cake before that it tastes better the next day, so at this point, I wrapped the cake in plastic wrap and refrigerated it overnight. The next day, I finished the cake with sliced strawberries. We celebrated Mom’s birthday with this cake for dessert after dinner. It was better than I remembered, and everyone had seconds. This is a great way to use fresh, height-of-the-season strawberries. In fact, I may just have to make this cake again before the good berries are gone for the year. My problems began with overmixing my genoise batter. I accidentally dumped 2/3 of the flour mixture into the batter at once, and it was impossible to get it all mixed in without deflating the batter. I probably should have stopped right there, but I foolishly pressed on, resulting in the hockey puck you see above. My daughter and I ate the strawberries and whipped cream, then threw out the cake. I probably would have been upset by this disaster if I hadn’t already found the perfect strawberry cake recipe. Check back tomorrow for the post. In addition to Tuesdays with Dorie, this post participates in Strawberry Week here at Of Cabbages & King Cakes. Check out the other posts for the week (I promise, this is the only disaster). Our hosts for this recipe are Allison and Sophia. Be sure to check out their posts. This week’s recipe for Tuesdays with Dorie — Baking with Julia was a new twist on an old favorite for me. I’m a big fan of shortbread cookies and love to try different versions of them (Nick Malgieri’s macadamia shortbreads were especially delicious), but I had never heard of Hungarian shortbread before making this recipe. What sets Hungarian shortbread apart from other shortbreads is that it is layered and filled with a tart fruit filling, rhubarb jam in the case of Dorie’s recipe. The other thing that is unique about this recipe is the way the shortbread is formed. 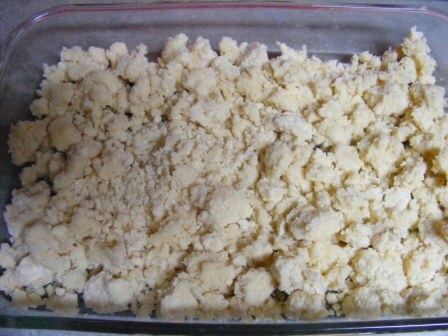 After mixing the dough, you divide it in half and shape each half into a ball, freeze the dough balls for half an hour, then grate the dough into the pan using a box grater. 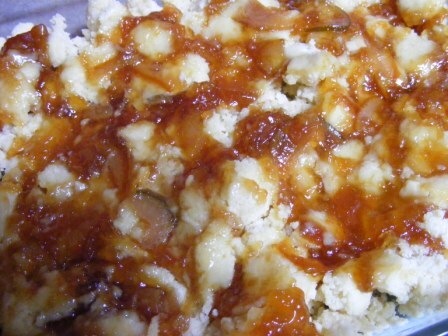 The filling is spread between two layers of dough, and the whole thing is baked. Finally, the shortbread is dusted with powdered sugar as soon as it comes out of the oven. I don’t really understand the purpose of freezing and grating the dough. The recipe says that it makes the dough easier to work with, but I didn’t really find that to be true. First, I had a heck of a time shaping the dough into balls and wrapping it. Then, when I tried to grate it, it got so crumbly that I gave up on the box grater and just crumbled it into the pan by hand. I think it would have been just as easy to press the dough into the pan from the beginning, and that’s what I’ll do next time. I’m generally not a fan of rhubarb, and it’s not really in season here yet, so I decided to use my homemade four-citrus marmalade for the filling. 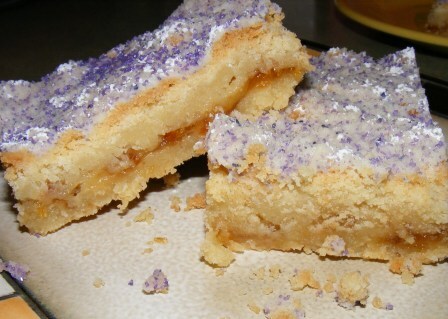 The tart bite of the marmalade offset the sweetness of the shortbread and brought the whole thing together. The shortbread baked up beautifully. Some of the other TWD bakers reported that their shortbread came out underdone, but mine was perfect. I dusted the top of the shortbread with powdered sugar as soon as it came out of the oven, as the recipe instructed. However, since it was hot, the sugar melted and got kind of funky. Next time, I’ll let it cool first, then dust on the sugar. And now, a word about purple. When I first looked at the picture of the finished shortbread in the book, I thought it was beautiful. 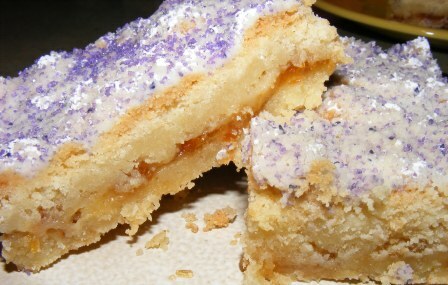 I especially liked the contrasting colors — the golden shortbread punctuated by the red filling and bluish-purple topping. I quickly turned to the recipe to see what made the bluish color on top of the shortbread, but the recipe just said to dust it with powdered sugar. Nothing blue; nothing purple — just powdered sugar. I flipped back to the picture, looked at it more closely, and realized the blue tint was just a reflection from the background. Undaunted, I decided mine would be purple. I tried coloring the powdered sugar with food coloring, but it didn’t mix in. 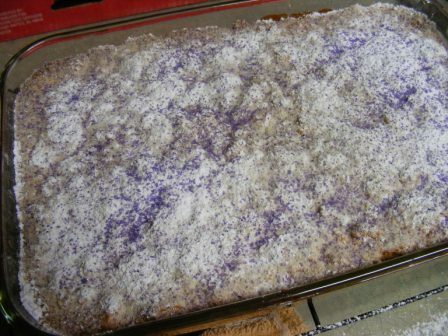 Then I stirred in purple finishing sugar that I use for King Cake. It mixed in fine, but when I dusted the top of the shortbread, the colored sugar didn’t make it through the sifter. I finally ended up just sprinkling the sugar on top of the shortbread. It didn’t give quite the same effect as the photo in the book, but I still liked the look of it. The final verdict: we really liked this recipe, and I’ll definitely be making it again. I might change up the filling, but I’ll keep it tart. And I won’t bother with trying to grate the dough; I’ll just press it into the pan. And, yes, I’ll use purple sprinkles again. This week’s Modern Baker Challenge recipe was, indeed, a challenge for me. Although Kayte, the official baker for this recipe in the Cookies, Bars, & Biscotti section, reported great success with these cookies, mine didn’t work out so smoothly. I’m sure at least part of the problem was my attitude going into it. I’m not a fan of fussy cookies, and with the mixing, chilling, rolling, cutting, filling, and icing required, these definitely fall into the fussy category. My problems began with the dough. It only has six ingredients — butter, sugar, vanilla extract, lemon extract, egg yolks, and flour — and I mixed it precisely according to the instructions. The dough came out OK, although it seemed a bit on the dry side. It had to be chilled for at least an hour or two before rolling, although the recipe notes that it can be refrigerated for up to three days. My dough sat in the fridge for about two days until I was ready to roll it out. 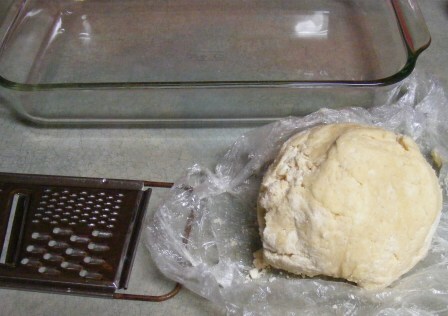 Kayte reported that the dough was easy to work with and rolled out without tearing or breaking. As soon as my dough hit the board, I knew I had a problem. My dough was dry and crumbly, and neither pressing it nor letting it rest at room temperature seemed to help. I managed to press out enough dough to cut nine cookies. The cookies baked up nicely, and while they were in the oven, I melted and reduced the blackberry jam to use as filling for the finished cookies. By the time the cookies were cool enough to assemble, the filling had set and needed to be rewarmed. In reheating the jam, I overreduced it. It was liquid enough to spread on the cookies, and the assembly was easy enough. Unfortunately, when the filling cooled, it was gummy and slightly bitter from having been overcooked. 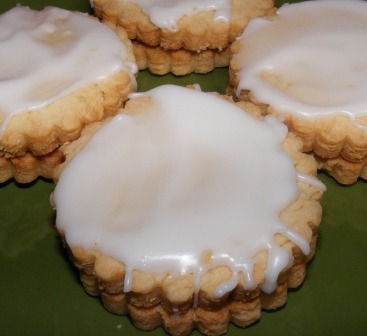 The final piece to these cookies was a simple lemon icing made of confectioner’s sugar, lemon juice, and water. Easy enough to make, it is then drizzled over the top of the cookies. Because I ended up with fewer cookies than the recipe called for, I cut the icing down quite a bit. In doing so, it came out too thick to drizzle. After trying, and failing, to make nice streaks of icing on the cookies, I spread it on with the back of a spoon. It turned out to be a bit too much icing, although it did counter the gumminess of the jam a bit. Overall, these were good cookies. And while I know what I did wrong with the jam filling and lemon icing, I’m still not sure what happened to the cookie dough. I’ll be making the chocolate sandwich cookies and raspberry linzer disks in the next few weeks, both of which employ a very similar dough and the same chilling-and-rolling method. It will be kind of like getting a do-over on the cookie dough and a chance for me to see if I can figure out what went wrong this time around. This is the second April recipe for Tuesdays with Dorie. 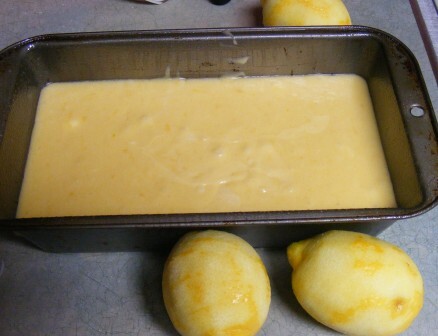 Unlike the pizza rustica, which involved mixing and rolling crust, making filling, and shaping a lattice topping, the lemon loaf cake was a quick batter that went from bowl to oven in about 5 minutes. In fact, the most complicated part of the whole thing was denuding the lemons. 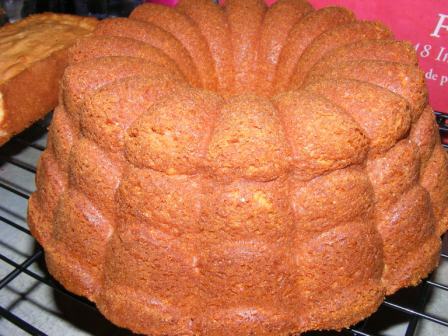 The cake baked up beautifully and smelled fresh and lemony when it came out of the oven. 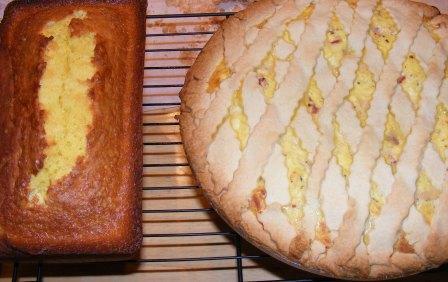 I served the lemon cake for dessert after a dinner of the pizza rustica. Both were big hits with my family. Our hosts for this week were Truc of Treats and Michelle of The Beauty of Life. Visit their blogs for the recipe. 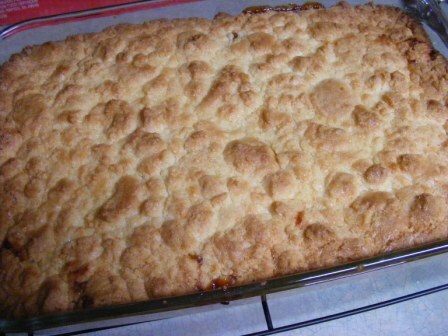 And check out the TWD main page to see what everyone else thought of this recipe. This week’s Modern Baker Challenge recipe is a simple, but kind of odd, little cookie. At least I’ve never made or eaten anything quite like it before. 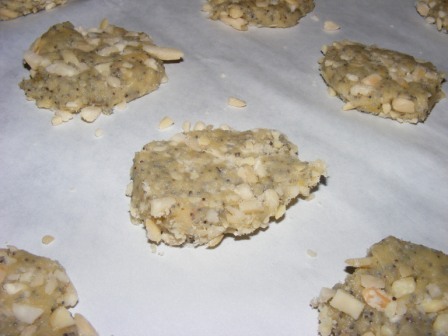 The main flavor and texture ingredients are lemon, poppy seeds, and almonds. 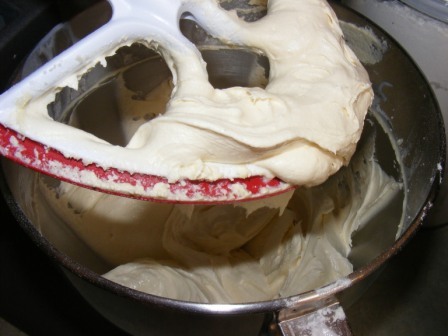 The dough also contains eggs, sugar, butter, vanilla, flour, baking powder, and salt. The poppy seeds were the ingredient that seemed a bit strange to me. 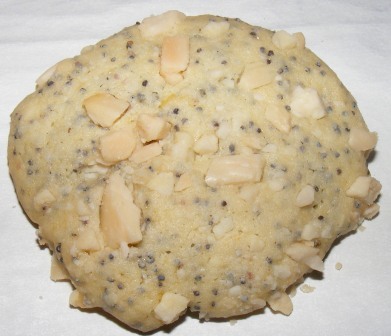 Other than keeflees, kolache, and lemon bread or muffins, I’m not familiar with using poppy seeds in sweets. And they had a strange effect on the dough — they turned it rather gray. So much so that I was a bit skeptical about making these cookies. After all, who would want to eat a gray cookie? But I pressed on. 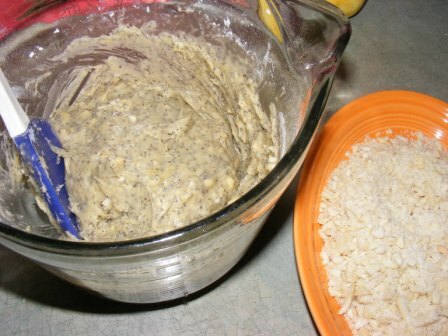 After all, with the dough mixed up and ready to go, it was just a matter of rolling hunks of dough in chopped slivered almonds, flattening them, and baking them. I found that the amount of almonds was almost perfect. My last few cookies didn’t have quite as many almonds on the outside, but I also didn’t have a bunch of chopped almonds left over. 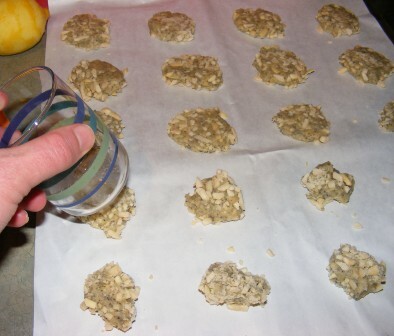 I flattened the cookies with the bottom of a drinking glass. Once they were all rolled and flattened, they were ready for the oven. I was still a bit worried about the color, but I had come this far, so I had to finish them. I baked the cookies in a 350°F oven for about 15 minutes, until they were golden, slightly risen, and baked through. The poppy seeds were still quite evident in the cookies, but they lost their gray pallor in the oven and actually came out looking pretty nice. Despite the appearance of the dough, these cookies were quite good. They weren’t too sweet and reminded me a bit of shortbread. 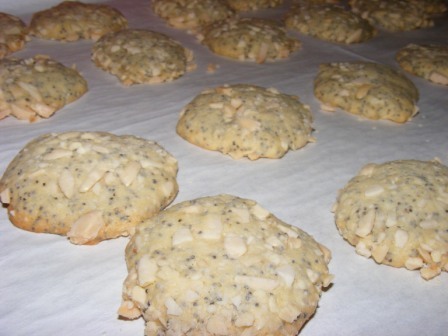 The lemon gave a bright flavor to them, and the almonds and poppy seeds lent an earthiness that worked well with the other flavors. And even though they weren’t overly sweet, I found myself reaching for them again and again, as there is just something “morish” (as my mother-in-law used to say) about them. These cookies would be great for a holiday tray, as the flavor is quite subtle and wouldn’t overpower the other cookies on the tray. Of course, they’re not bad on their own, either. This recipe can be found in the Cookies, Bars, & Biscotti section of The Modern Baker, by Nick Malgieri. If you want to add a great baking book to your library, this one has everything — from cookies and cakes to pies, tarts, and breads. And the recipes are clear, concise, and easy to follow.